At just 6-foot-1 and 174 pounds, Mark Pysyk doesn't have the broad shoulders of some of the bigger players in the 2010 Entry Draft class. However, he was forced to carry most of the load at both ends of the ice this season for the WHL's Edmonton Oil Kings, and while his numbers might not show it -- 7 goals, 24 points and a minus-19 rating in 48 games -- they don't tell nearly the whole story. He played more than 20 minutes a night, and finished eighth on the team in scoring despite his season ending Feb. 10 due to a broken foot. "We're really proud of the way Mark has developed both as a hockey player and as an outstanding member of the community," Edmonton GM Bob Green said. "He carried our team on his back a lot of nights this winter, and the fact that he played on a broken foot for a couple of games before he was forced to end his season early shows how much character he's developed." Playing for the Oil Kings the last three seasons certainly has taught Pysyk how to deal with adversity. The franchise's first bantam pick for its inaugural 2007 season, the Oil Kings have missed the playoffs twice in Pysyk's three seasons, and in 2009-10 had the second-fewest points in the league. "We went on an 11-game losing streak this year," Pysyk said. "It's tough to get over those and we can't really win in the shootout right now. But it's coming, and I think just pushing through that, sticking together as a team, I think that helps me out as well." Despite the team's poor play, Pysyk stood out for his vast array of talent. "No one is as explosive from the back end as he is," Peter Sullivan, who scouts Western Canada for NHL Central Scouting, told NHL.com. "He moves the puck as well as anybody. But his points don't indicate how valuable he is to a team and I think maybe it could be a cliché, but if he played on a better team, you'd even see him higher up in the votes." Sullivan wasn't the only scout who felt that way. As Edmonton sunk in the standings, Pysyk rose in Central Scouting's rankings, moving up from No. 9 in January's midterm rating of North American skaters for the 2010 Entry Draft to No. 7 in the final release in April. 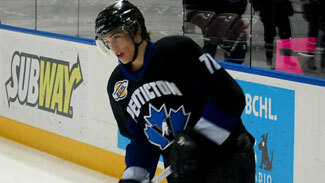 He's the second-highest rated WHL skater for the June 25-26 selection process, behind No. 3 Brett Connolly. Pysyk, however, isn't letting draft rankings worry him. "You try not to pay attention, but you know it's there," Pysyk told NHL.com. "I think it's a good accomplishment for myself. So many kids playing hockey that you've played with and stuff. Everybody's been working hard. You're closer now to the NHL. It's cool seeing that stuff." Beau Bennett grew up not far from the site of the 2010 Entry Draft, but he had to make a side trip to Penticton, B.C, to help NHL scouts find him. Pysyk recognizes there are things he needs to get better at before he's ready to move to the next level. "I need to work on my shot and getting bigger, stronger, playing with a little bit more of an edge," he said. "And also foot speed. Everybody can always work on that. You never really can be satisfied with any part of your game." That's been a hallmark of Pysyk, going back to his first days on skates on the outdoor rinks growing up in Edmonton. "My sister (Nicole) is a better skater than me, so that might be why I kept going, to get better, because I couldn't live with her being better," Pysyk said. That's also where he got used to playing long stretches in games. You wanted to keep moving playing outside, because it really was the only way to stay warm. "The tournaments were outdoors, and we'd take shifts two minutes long, three lines, and then you'd go inside the community hall to warm up your feet because it was probably minus-35 out," Pysyk said. He won't have to worry about too many outdoor games in the deep freeze in his future -- most NHL games are indoors now. However, playing in the NHL requires more than just a high skill level and the ability to put up with some cold weather -- it's dealing with the day-to-day pressure and expectation that comes with playing hockey at its highest level. Being in the glare of that kind of spotlight is something Pysyk admits he's still getting used to. "I don't really enjoy it," he said. "I'd rather be out playing on the pond, just messing around. It (the pressure) is going to be there. If you want to play in the NHL it's going to be there, so you have to deal with it. If I can block that out and just pretend nobody's watching, not try to impress anybody but yourself, and just work hard that way." He'll be getting more time in the spotlight in the near future as he was one of 41 skaters invited to Hockey Canada's junior evaluation camp, which will help set the roster for the 2011 World Junior Championship team. He won't have to be the man again, but if he's needed, he certainly has experience filling that role.